I love the round table in the middle of the seating area. It also pulls in most of the colors I love. I don't know if I love the busyness of the rug with the furniture. I think I would go with something more solid. But I love the shade of blue and how well it goes with the pink, green and brown. Here's another one of those round tables that I love. I love the pop of the yellow. I love to see colorful rooms. I'm a little iffy on the rug again, I think it is too busy for the size of the room. I do like the different patterns in the pillows. I wish I knew where the white side table came from. It is so cool. I love the curtains separating the two areas in this room. It keeps them defined in a great way. I really love the cushy ottoman. Someday I will learn to make me one of those. 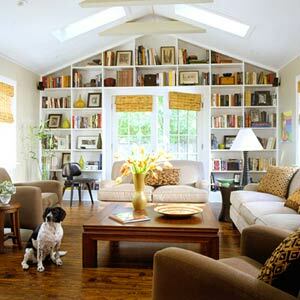 I love the built in bookcases in this room. My book cases are definitely overstuffed and I would love to have a whole wall of shelves to fill like these. I am sure I will find more pictures that I love for my great room. I look forward to the time when I can post my actual great room decorating.